Industry legend Grant Morrison penned a number of Doctor Who comics in the late ‘80s and this two-issue series collects them all. 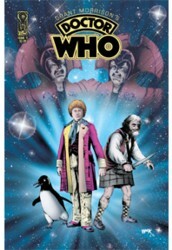 This issue includes the three-part “The World Shapers” with art by John Ridgway and featuring the Sixth Doctor (as portrayed by Colin Baker). All the stories in this series are being colored for the first time.